Be a part of my Wildlife travelougue! 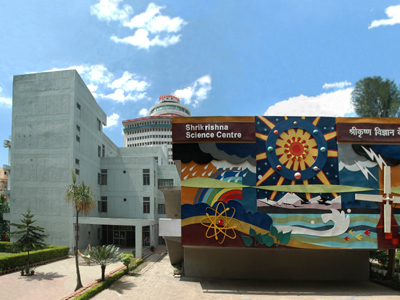 Sri Krishna Science Centre, Patna was the last on my list of places that I had chalked out to visit in Patna but I was sure by no means was it going to be less rewarding. I instructed my taxi to take me to the West Gandhi Maidan. As we reached the Maidan I saw school buses parked. The centre was sure to be packed with school children who most likely had their vacations going on and it is surely very rewarding to have such trips planned for them. At the entrance was a very colorful hoarding, which had a graphical and visual representation of all that the centre is about. I entered and picked up an information pamphlet, which had all the necessary information about the galleries at the centre. At the ground floor is the Fun Science Gallery. I saw a lot of exhibits inside solving the critical problems of physics and mathematics. In the first floor, there are interactive fun and interesting science projects solved and this gallery is named Mirrors and images Gallery. Then, I came across what I loved the most – the science park and near it are the rooms, which have information on the oceans and evolution. It was amazing that I, being an environment student still did not know some of the mystifying secrets embedded in the heart of our oceans. There is also the 3D show section, which has these movies using state-of-the-art technology, which now though is a little common but was once quite a rage, but at 10 rupees the prices here are very minimal allowing the lay man to enjoy these shows. Next, I saw the laser show, which is equally impressive. After this I had a tryst with my childhood friend, the dinosaur with all its information written here. I also came across a section where there is a tribute given to all the eminent Indian scientists. Thus, with it my trip to Sri Krishna Science Centre, Patna came to an end and also ended my trip to Patna. I carried a tank of memories and information with me back and would surely visit the city again if given a chance. Hi, I am Indrajit Gahlot from Uttar Pradesh, currently studying to be an environmental engineer which I hope to follow up with an MS degree from USA. Most of my growing up years were spent in Lucknow. I have always loved nature but only recently I have started taking nature and wildlife trips with friends. We go on 3 to 4 day trips mostly to places in the North and I must say the experience has been totally amazing. Being out in the open is an exhilarating experience. As someone rightly said - the mountains are calling and I must go. You can find details of my trips on this blog. Adiós ! Things To Do In Lonavala – Time For Fun And Frolic!